Anales Inst. Biol. Univ. Nac. Mexico 27:347.1957. TYPE: Mexico. Oaxaca: between La Gloria and Río Grande, MacDougall s.n. (MEXU, holotype). Terrestrial; stems 2 cm diam. or larger; cataphylls triangular, drying reddish-brown, weathering into moderately thin longutudinal fibers. LEAVES with petioles to 50 cm long, 7-9 mm diam., bluntly sulcate adaxially; geniculum 1.5 cm long, thicker than petiole, obtusely and narrowly sulcate; blades coriaceous, narrowly ovate, acute at apex with short apiculum, deeply lobed at base, to 35 cm long, 22.5 cm wide, broadest just below point of attachment; the anterior lobe 25.5 cm long; the posterior lobes 12.5 cm long from apex of sinus to tip of lobe; sinus obovate, rounded at apex; upper surface semiglossy, with sparse glandular punctuation's, lower surface semiglossy with dense glandular punctations (the punctae irregular, to 0.4 mm diam. ); the midrib prominently raised above, diminished and sunken at apex, sharply raised below; basal veins 5-6(7) pairs, the 4-5(6)lh coalesced ca. 3.5 cm; posterior ribs slightly curved, the outer margin curled up and inward; the primary lateral veins 4-5 per side, scarcely visible, departing midrib at 50° angle, curved to the collective vein, raised below, interprimary veins scarcely less prominent than primary lateral veins; collective vein arising from one of the basal veins, 2-10 mm from margin. lateral tepals ca. 2 mm wide (dry), the inner margins concave; pistils weakly emergent; the stigma ellipsoid, 1 mm long; stamens exserted just above edge of tepals; anthers held at edges of pistil, 0.5 mm long (dry), 0.7 mm wide; thecae broadly elliptic, scarcely divaricate; pollen not seen. INFRUCTESCENCE not seen. Fig. 160. Anthurium riograndicolum is known only from the type specimen collected perhaps in eastern Oaxaca, although no typical aroid collecting area is represented there. The notes by MacDougall attribute the collection from between "La Gloria and Río Grande." There are a number of towns with either name in Oaxaca. The species is a member of section Belolonchium and is distinguished by its coriaceous, ovate, glandular-punctate blade with an acute apex and conspicuous posterior lobes with an obovate sinus. The species resembles A rzedowskii, which also has thick, ovate, lobed leaves but that species has a much broader spathe and lacks glandular punctations. 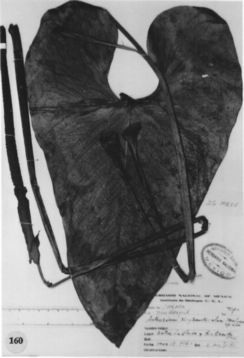 Anthurium riograndicolum is probably most closely related to A. lucens and may prove to be inseparable from it, but the species is currently represented by only the incomplete type specimen that diners from A. lucens primarily in having thicker blades that arc acute rather than acuminate at the apex. MEXICO. OAXACA: between La Gloria & Río Grande. MacDougall s.n. (MEXU).